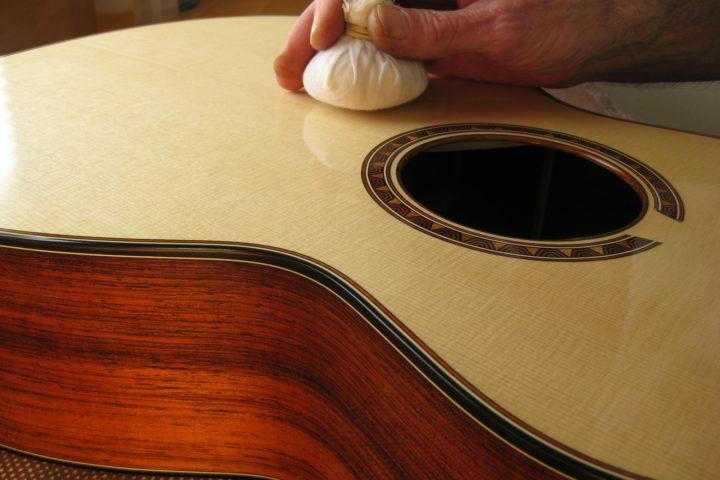 The origins of the 12-string guitar are fairly mysterious but from what we know they first started appearing in builder’s catalogs sometime in the very late 1890s. 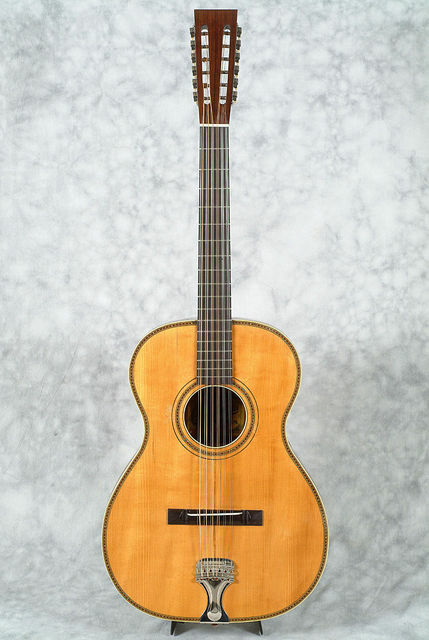 (Check out Gregg Miner’s site for a good overview of the current thinking on the early history of the 12-string guitar.) They didn’t make much of an impact in the general guitar market but in the 1920s they were popular with Mexican musicians in the border sates and with blues players like Barbecue Bob, Blind Willie McTell, Lonnie Johnson and, perhaps the most famous 12-stringer of them all, Huddie Ledbetter, who is better known by his nickname, Lead Belly. Lead Belly was born in Louisiana in the 1880s and learned to play guitar, piano, accordion, mandolin, violin and harmonica. He had a nasty temper and wound up in prison numerous times for fighting, and in one instance, manslaughter. In 1933, the folklorist John Lomax heard Lead Belly perform on a song collecting trip and helped get him pardoned and released from prison. It appears that Leadbelly had started playing a 12-string guitar sometime in the 1920s and after his got his freedom he bought a new Stella very much like the one here. 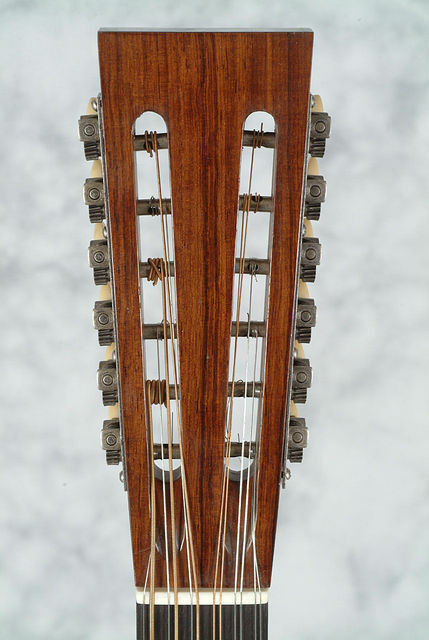 Unlike most modern 12-strings, which are designed to be tuned to E like a standard six-string guitar, old Stellas were set up to be tuned down to D or C. The scale length on this guitar is 26 1/2-inches, about an inch longer than most modern guitars, but when they are set up correctly, they just rumble and roar like nothing you’ve ever heard. Old Stellas are extremely hard to come by these days, particularly the large bodied ones like this one which is the same model Lead Belly played. 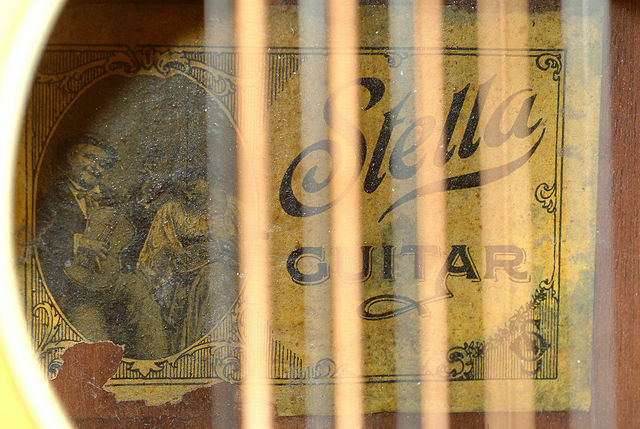 After Lead Belly died in 1949 the world sort of forgot that 12-string guitars existed and for a while Stellas were essentially worthless and consequently not many survive in playable condition. (Check out the story of this old Stella for an example of how they sometimes look when they turn up.) 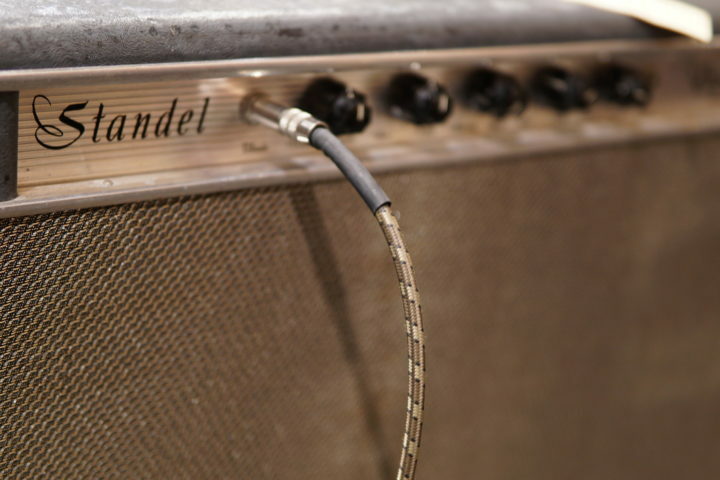 The Stella pictured here has been fully restored and is now in sound physical condition. 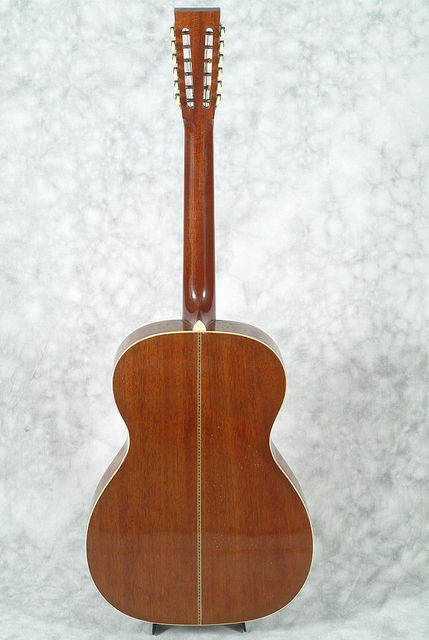 It has been refinished and it has had a new neck made. 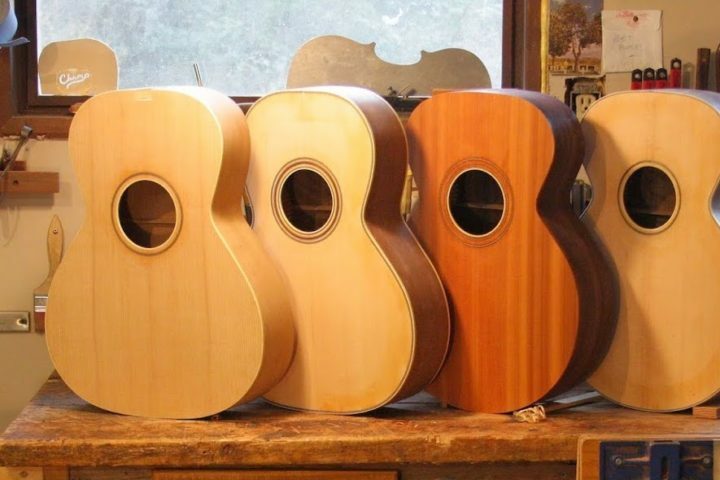 (A lot of old 12-strong players used heavy strings on these guitars and since the necks didn’t have truss rods, many of them were warped and twisted beyond repair.) I haven’t played this actual guitar but I have played a few originals and I suspect this guitar has all of the sound of an old guitar with the playability of a new instrument. If you’d like to find out for yourself, just send $5500 to the good people at Elderly Instruments.